TDS and income tax software is a comprehensive Tax-Deducted-At-Source Return software designed by LegalRaasta. Legal Raasta TDS return filing software helps companies easily import data from various file formats, automatically verify TAN and PAN number, OLTAS linking, form generation, TDS calculation, and more. Legal Raasta TDS software supports TDS on Salary payments (Form 24Q), NRI (Form 27Q) and TCS (Form 27EQ), Rent, Interest, Commission and other Non-salary transactions (Form 26Q). Legal Raasta TDS software comes in four packages; free demo, standard edition, assisted filing (single ), and assisted filing (package). Unlimited quarterly return and correction returns for free TaxRaahi Income Tax Software is a cloud based technology, requiring no installation thus freeing the storage space used on your computers. Automatically Verify PANs from ITD Individuals, Chartered accountants& companies can use our tax filing software to automatically compute income from all the five heads (Salary, House Property, Capital Gain, Other Sources, & PGBP), deductions and taxes thereon. Automatically Verify Challans with OLTAS With our ITR software you can just bulk upload the form 16’s parsing all the details saving the effort to punch data manually. Q. What are the steps to File TDS Return with LegalRaasta TDS Software? You can file TDS return through LegalRaasta TDS software in just 5 simple steps: 1. Add Deductor: Add Deductor details such as TAN Number, Address etc. You can also import from excel sheet or conso file. 2. Add and Verify Challans : Enter challan details and verify challans from OLTAS directly with our LegalRaasta TDS software. 3. 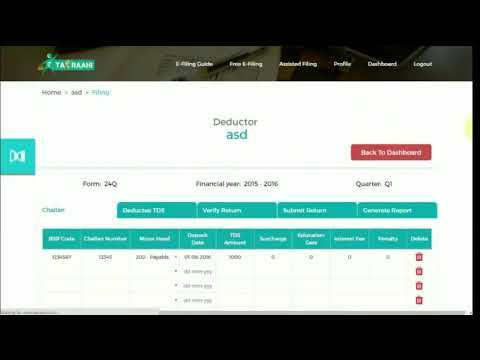 Add Deductees/Employees: Add deductees along with their PAN and TDS Details. 4. Match Challan with Deductees: Choose the challans for each deductee. If any challan amount is unused is can be carried forward to next quarter. 5. Verify Return and Generate FVU for TDS Return Filing: Check for suggestive and validation errors. Once all the validation errors are fixed you can generate FVU from our TDS software. Q. Do I need to install the any government utility or Java to file returns via LegalRaasta TDS software? Q. What are the charges of filing return through LegalRaasta TDS software? Is it free? LegalRaasta TDS software is free for CAs, SMEs, and corporate for the first 5 returns. Post this; you can buy our software plans starting as low as Rs. 99 / return. Q. Why is LegalRaasta one of the best TDS return filing software in the market? LegalRaasta is one of the best TDS return filing system because of the following reasons: LegalRaasta is the only software which offers free return filing (for the first 5 returns). TDS Returns can be filed through LegalRaasta in just 5 steps and in less than 5 minutes. It will take you at least 15-30 min to file returns in other software. LegalRaasta always easy import from excel and previous year returns. LegalRaasta automatically verifies PAN and Challan details. Q. What are the last dates for filing TDS returns?